Last March, I decided that I would spend January 2018 remote working. Anyone currently living through Toronto’s winter doesn’t need me to explain what prompted the decision. For the next four weeks, I will be living and working in Montevideo, the capital of Uruguay. I love to travel, so deciding where to spend the month was exciting, but also daunting. I knew I wasn’t just planning a vacation, I was finding a place where I could live and work. I invested a lot of time into thinking through what I needed to remote work successfully, and came up with a hierarchy of needs, Maslow-style. I thought I’d walk you through them, so if (when!) you too decide to remote work, you can use these considerations as a starting point. Everyone’s priorities are going to be different, but the point is that thinking through what you need to thrive will set you up for success. Safety – For me, this meant personal safety, political stability and, after the challenges that 2017 wrought, a place that was unlikely to be affected by natural disasters. Personal safety is a topic that affects women even more acutely than men, and many remote workers and digital nomads use this website as a guideline. Montevideo rates favourably on this list and is often cited as one of the safest places to visit in South America. Time zone-friendly – my business, while relatively location independent, is strongly tied to the Eastern Standard Time (EST) zone. Because of this, I decided I would be better off staying somewhere in the Americas instead of going to Europe, Africa or Asia. The glamour of living in Morocco or Japan would quickly fade if I was continuously taking calls in the middle of the night. Fast, reliable Internet – many people smirk when they realize how critical this was to my decision, but if you work a desk job, imagine doing it with slow, spotty Internet. I used this map to determine where I could maintain a strong connection to my clients and was surprised to learn (as I’m sure most people would be) just how good Uruguay’s communications infrastructure is compared with the rest of Central and South America. I can personally attest that the WiFi is super-fast, although it does disconnect more than the WiFi back home. Easy living – Since I’m going to be here for a month, I wanted to ensure that I was going to be somewhere that, to be blunt, I wouldn’t be sacrificing my quality of life much, if at all. I wanted easy access to groceries, restaurants, nice walking routes and good public transportation. Uruguay is one of the most economically developed countries in South America with a good quality of life and ranks highly on livability studies. Every street in my neighborhood is tree-lined, and there’s a little market that rivals Whole Foods down the street. Good set-up for remote workers – I was hoping to find a spot with some co-working spaces, which admittedly is getting easier and easier in cities around the world. 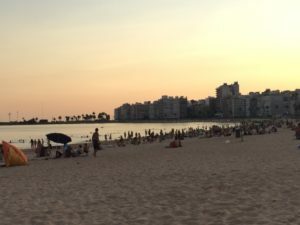 Montevideo has several co-working spaces and a decent remote working/digital nomad community, although places like Thailand and Bali would be better in this area. This is the view less than 10 minutes from my apartment. Things to do and see – the reason I love to travel is to experience different cultures, and I wanted a place that had some history, some museums, a historic section, good food and maybe even a little shopping. The fact that I’m so close to Buenos Aires also doesn’t hurt. Beach, baby! – let me just say, living about 10-minutes walk from the ocean is about the most luxurious thing I can imagine. This may be the only time in my life that this happens, so you can be sure I’ll be making the most of it. Long days – I’m sure I’m not alone in finding it depressing how early it gets dark in the winter. I was hoping to go someplace south of the equator so I could enjoy their equivalent to our July. It stays light until 9:00pm here, which is such a treat. English speakers – let me preface this by saying that it is of course the responsibility of the traveller to learn the native language, not the other way around. That having been said, travel is certainly easier when you can ask the locals for help and advice. If this is a priority for you, Uruguay should not be on your consideration list. I can already tell that the lack of English-speaking locals will make certain things more challenging (like figuring out public transit), but hey, I figure it will help me master some Spanish. Budget-friendly – it would be great to remote work on a very small budget and there are some places, like Thailand, where this is possible. But you also have to remember that good quality of life tends to go hand-in-hand with a higher cost of living. Uruguay is not the cheapest place to go, but I was willing to pay a little more to be somewhere where I would have the amenities I wanted. Nightlife – for some, this will be critical, but I’m not much of a drinker or partier, so it’s not my priority. It’s only been a few days, but already I feel like I have chosen a place that will work well for me. I’ll keep you posted on what I learn during this month, the do’s and don’ts of remote working, so that when your turn comes, you’ll be ready.